Dr. Nancy Troike from the University of Texas at Austin authored the introduction to this facsimile edition. She traces the complete known history of this manuscript from its inital appearance in Italy in 1854 to its present location in the British Museum. 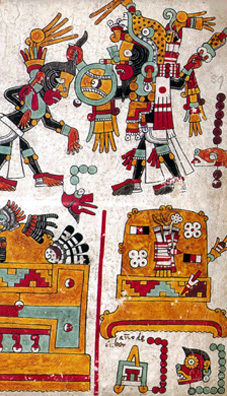 Dr. Troike's introduction brings out additional information on this codex not available in commentaries to earlier editions. Also, the ADEVA edition is true color, full size, and in original ancient Mixtec fashion, accordion-folded. The flow of events and personalities is easier to study in a continuous folded format than when broken up by modern bindings in page format. Graz 1987. Vol. 84 of the series CODICES SELECTI. True-color facsimile edition of the hand painted manuscript in possession of the British Museum, London. 96 folded pages. Format: 245 x 191 mm, total length: 11,22 m, folded continuously in PreColumbian screenfold format. German preface by Dr. F. Anders, University of Vienna and notes on Codex Zouche-Nuttall in English by Dr. Nancy P. Troike, University of Texas at Austin, consisting of 46 pages, 5 text illustrations.